Dubai is one of the world’s most exciting dining destinations, a vibrant city with unparalleled multicultural cuisine. From snacks and fast food to gourmet meals, you can get every food here at a very affordable cost. For many residents, eating out from one of these food outlets is a favorite past-time, while for many others it is a necessity. This ease of access to energy dense food is a double-edged sword that could have contributed to the steady increase in obesity and diabetes among the residents. Increasing the access to healthy food choices in these eateries is thus a priority for Dubai Municipality. It is not enough for these healthy food choices to be merely available, but they also need to be authenticated and made clearly visible to the consumers. 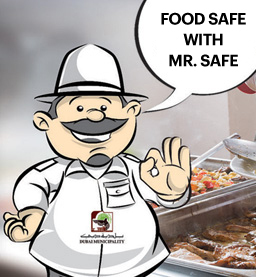 Food Safety Department of Dubai Municipality launched the Eat Healthy, Live Healthy Initiative to identify, evaluate and certify the dishes served in Dubai eateries. The certification program involves evaluation of the ingredients, calories, salt and saturated fat content of each food item that is certified, and verification programs after certification to ensure ongoing compliance. The foods that are thus certified will be made visible to consumers through several means including identification of the certified foods with a unique logo. Food establishments can apply by meeting a set of requirements and criteria to certify the dishes on their menus.